Up until today, I have been able to crochet outside on my screened-in porch. It has been so beautiful outdoors lately, and I have been trying to enjoy every single minute of it! But today, even in the sun, it was cold! The temperature said it was 66 degrees, but it sure did not feel like it. What a difference it can make in the temperature when the wind blows. So I did not crochet outside today! I wonder how many more days I am going to be able to crochet outside on my porch? I am working on a snowman bib that I think is going to be very cute…..at least I hope it turns out to be cute! It is supposed to be published on-line. If and when it is, I will post a link to it. >Up until today, I have been able to crochet outside on my screened-in porch. It has been so beautiful outdoors lately, and I have been trying to enjoy every single minute of it! But today, even in the sun, it was cold! The temperature said it was 66 degrees, but it sure did not feel like it. What a difference it can make in the temperature when the wind blows. So I did not crochet outside today! I wonder how many more days I am going to be able to crochet outside on my porch? >As promised, I am slowing trying to move some of the free patterns from my old geocities website. I have uploaded a couple of new ones recently. You can view them at: Crochet Cafe Patterns. As usual, almost all of my patterns are quick and easy to make! I haven’t been able to do much posting lately of the crocheting that I am doing! When I am working on new crochet designs for other editors or publishers, I can’t show photos of my work. As soon as I start working on self-published designs again for my own website at: Cute and Country Crochet, I can show you a few progress pictures! As promised, I am slowing trying to move some of the free patterns from my old geocities website. I have uploaded a couple of new ones recently. 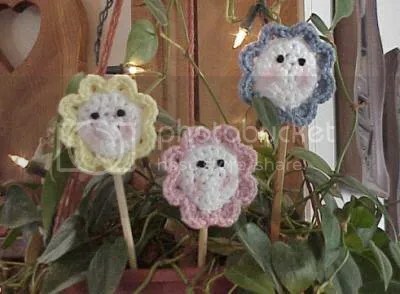 You can view them at: Crochet Cafe Patterns. Rnd 1: With White, ch 2; 6 sc in 2nd ch from hook, join with a sl st to first sc, ch 1, turn. (6). Rnd 3: (Sc in next sc, 2 sc in next sc) around; join, ch 1, turn. (18). ch 2, 4 hdc in same st, skip next st, sl st in next free loop, (5 hdc in next front loop, skip next st, sl st in next front loop) around; join with sl st to top of starting ch-2. Fasten off. Using Black and French Knot, embroider eyes between Rnds 2 & 3, 1/2″ apart as shown. Using makeup and cotton swab, CAREFULLY blush cheeks. Glue wooden skewer OR magnet to back.